We have many other tents available. 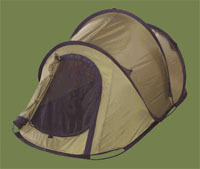 Check out our tent manufacturing catalog! Pinnacle Tents manufactures and supplies custom and standard camping tents, equipment tents, portable emergency shelters, and other types of custom tents and portable shelters for any need. We have over 30 years of tent design and tent manufacturing experience to create the standard or custom camping tent, equipment tents, or portable emergency shelters that you need, customized to your application. We offer private labeling with your logo or trademark name on all of our custom tents. Whether you are looking for unique sales force marketing portable shelters displaying your branded name, a better tent design for your Outfitter or Expedition Company, standard tents for your organization, standard wholesale tents for resale, or that unique corporate gift, Pinnacle Tents can supply the tent or portable shelter you need. Copyright © 2009 Pinnacle Tents. All Rights Reserved.